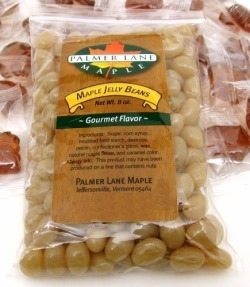 Gourmet Maple Jelly Beans, 8 oz. pkg. Gourmet flavor that is truly delicious! Shown here surrounded by our hard maple candy maple leaf drops these Maple Jelly Beans are in good company. 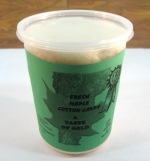 We sell thousands of hard maple candy maple leafs each year and we anticipate that maple jelly beans will be very popular as well. They truly are gourmet. These are NOT like those same old same old jelly beans sold in big box stores. No sir! And that's why you won't find them stacked piles high on store shelves. Ingredients - Sugar, corn syrup, modified food starch, dextrose, pectin, confectionary's glaze, wax, natural maple flavor, and caramel color. Allergy Info. - This product may have been produced on a line that contains nuts.